One moment, you’re on top of the world, the next, completely helpless. Weaponless, defenseless, and pretty much helpless. Last time, we talked about nine games that took away all our weapons. This time, we talk about nine more games that stripped us of all resistance. One of 2017’s finest games features a challenge which takes away all of your weapons, armour, and items. Being marooned on Breath of the Wild’s Eventide Island means contending with a lumbering, giant hinox. Fighting bokoblins with branches. It means solving the island’s puzzles with your acquired tools and your wits in order to survive. The concept of being weaponless may not be particularly new. 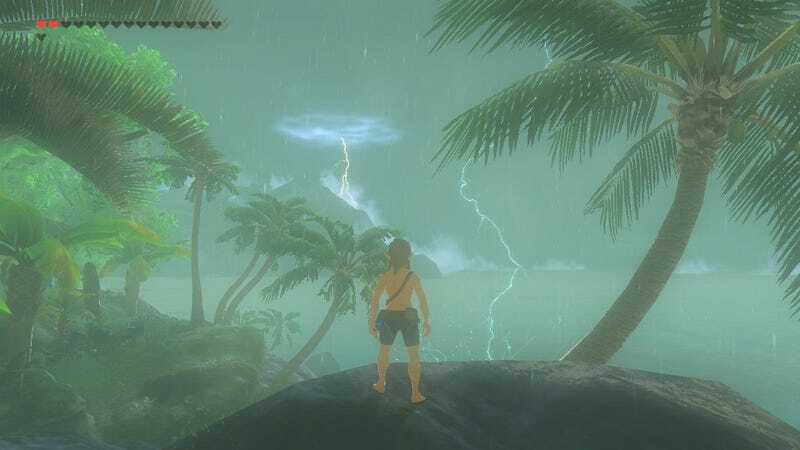 Depending on when players discover Eventide Island, it can be a harrowing experience if facing its challenge early on. Or it can feel empowering in later game stages, equipped with knowledge to adapt to the situation with learned tricks and skills to breeze through whatever the island tosses out there. Alucard was a solid character in Castlevania 3, especially because he could turn into a bat and fly past so many of the tricky obstacles the game threw at players. Unfortunately, his biggest problem was he was awkwardly slow and difficult to control in his normal mode. Between Castlevania 3 and Symphony of the Night, Alucard did a lot of crossfit training. He’s so fast now, he leaves a trail of his own images behind him. Alucard’s opening invasion of Dracula’s castle makes you feel like a badass. Mow down the zombies, whisk past enemies, wreak havoc. That is, until Death shows up and strips you of all your weapons. Your fists feel puny, your one-hit kills are gone. We felt as helpless as we were back in Castlevania 3. Ah, the infamous Chapter 13. Since its 2016 release, Final Fantasy XV has received a flow of DLC including story chapters for the three other members of Prince Noctis’ boy band, a multiplayer mode with a great character customization editor, and an alternative way to experience Chapter 13. Everyone had something to say about the accursed chapter when it first came out. There’s even a guide to help you cope with just how traumatizing it is. It was ill-received for leading Noctis into hallways stalked by zombie-like enemies. But you could hide into nooks and crannies to avoid encounters! That’s...something, right? Chapter 13 became akin to a Resident Evil nightmare with not-so-good stealth mechanics. It was the opposite of the bulk of the game. In the earlier portions, Noctis and crew spent carefree days riding in their supercar, the Regalia, with the top down listening to classic Final Fantasy tunes. They did this in a big ‘ol open world setting at their leisure between hunting monsters and fishing. Those were the days! They seemed so fleeting by the time Chapter 13 hit, and to top it off, Noctis lost his weapons and his friends at the beginning of that hellish game section. Losing weapons is one thing. Losing Prompto, Ignis, and Gladio is a whole other insult. It is probably one of the scariest things Final Fantasy has ever done. Even with a gun in your hand, you can feel weak. In The Last of Us, Clickers have you constantly on edge, ready at any moment to turn you into a home town buffet of organs and skin. When Joel gets caught in one of Bill’s traps, he’s upside down, feet chained, and feeling very vulnerable to the waves of infected who sprint his way. It’s a race against time as Ellie tries to free him and the Clickers race your way. Shooting upside down is an panic-inducing mess that can’t end soon enough. In a game full of tense moments, this one had us feeling infected vertigo. If a game has ‘Dragon Quest’ in the name, chances are it will be a gut-wrenching experience in some measure. 2016’s Dragon Quest Builders, the Minecraft-esque sandbox with a story-focused direction, lives up to the name. It’s also so much more. It’s bleak, sure. But it’ll also surprise you. It’ll make you laugh, too. The game’s silent protagonist with a wealth of sass sets out to rebuild the world. But the world is not exactly his/her oyster—crafting recipes have to be earned and remembered through fighting, collection, and meeting NPCs’ requirements. Grand castles and towns aren’t built overnight. Protecting these towns from evil hordes is important, too. In the end, a small glimmer of hope is restored to bolster the faith of the humans who lost their world to darkness and evil. Rebuilding the world is a step by step process which begins with your character stripped of just about everything. Good clothes, weapons, and crafting memories. Imagine tackling a slime with a twig picked up from the dirt. That’s how hopeless the world is in Dragon Quest Builders. Life gets better as new recipes are unlocked and steel blades can be made. But you’ll never forget your humble beginnings with the twig in hand. If you think that’s bad, and if you haven’t yet played this fantastic entry into the Dragon Quest universe (the game is slated for release on the Nintendo Switch in 2018 as well), there’s a surprise waiting at the beginning of every heartbreaking chapter which we won’t spoil here. Horror films don’t scare us anymore thanks to horror games. Resident Evil 7 VR is one of the most terrifying and scary experiences we’ve had because it felt like we were actually there in the Baker Family Mansion. Texas Chainsaw Massacre and The Evil Dead combined, it was like living through a grindhouse flick, and you know how that turns out for the majority of “little people.” While we could only play in 30 minute bouts thanks to motion sickness, that half hour was living hell, especially in the opening without any weapons, aggravated by by vertigo and monsters that wanted to eat part of us and leave the rest for leftovers. Never had a game felt so palpably dizzying. The most depressing sequence in a last gen game was when I, Peter, became a homeless vagabond in Beyond: Two Souls. I wrote about the sequence a few weeks ago and how begging for a few dollars became one of the most stressful and painful moments I’d experienced in a game. Even the supernatural powers I had access to through my spirit buddy, Aiden, felt helpless in the face of poverty. What moved me most was the way Quantic Dream humanized everyone’s plight and even helped Jodie find her will to live again. Clock Tower is the ultimate experience in vulnerability and weakness. The Scissorman can show up anywhere at any time and relentlessly chase you. Unfortunately, you’re weaponless the whole time. There’s no right way to play the game and the multiple endings encourage playthroughs. The Gothic aesthetic is both gorgeously macabre and grandly ominous. The music was noticeable for its absence as most of the game has you searching the mansion in silence, one that is shockingly shattered by the appearance of the Scissorman. We hated feeling like a single wrong turn could turn us into a human papier-mâché. What’s worse than being afraid of evil undead enemy spirits who have blood dripping out of their eyes? Seeing through those bloody eyes in a weird game mechanic called sightjacking. Siren was all about helplessly moving from point a to point b and hoping the shibitos didn’t kill you as it was a one-hit death after they detected you. Even more creepy than the cultish spirits was the devotion with which they brought about their bloody apocalypse through an infinite sea of red water. I (Peter) knew multiple people growing up who were part of church’s that believed the rapture described in Revelations was coming on X date and gave up everything with their families to prepare- only for the time to awkwardly pass by and no Armageddon to happen. I wish they didn’t seem so disappointed and I wish more people longed for life and paradise rather than the end of the world. Then maybe we’d all stop feeling so defenseless and scared. You wanna talk about defenceless and scared, try Amnesia: The Dark Descent. Also Outlast. No comparison, true horror. Video games will continue to rob us of our freedom by taking away our power, our weapons, and our confidence. We’ll continue to be freaked out when they do. If it’s any consolation, it (probably) won’t last forever but it sure will feel like an eternity in that moment. There’s nothing we can do about it but grit our teeth, be terrified, and then keep moving forward.